The ground under your feet might seem solid, but you’re standing on a relatively thin crust of rock above a vast ocean of rock. 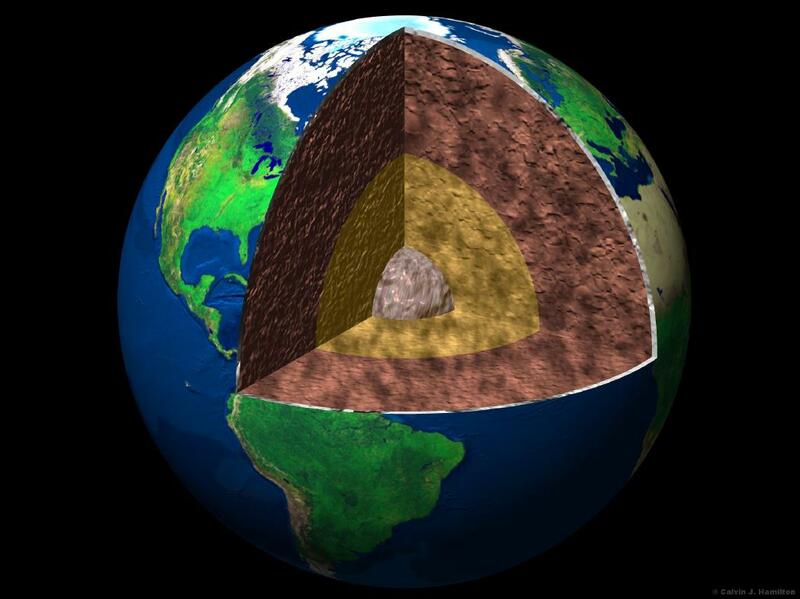 This molten rock is the Earth’s mantle, and it comprises the largest part of the Earth’s volume. The crust we stand on is only about 30 km thick. Out in the oceans, it’s even thinner, getting down to 5 km in places. Beneath this crust is the mantle of the Earth; a region that extends down a depth of almost 2,900 km. Although the mantle is largely hidden from our view, we do see it in places where cracks open up, allowing the molten rock to escape. These are volcanos, of course, and the liquid rock we see pouring out is the same as you’d find in the mantle. The Earth’s mantle is mostly composed of silicate rocks that are rich in iron and magnesium. Although it’s mostly solid, it’s hot enough that it can flow over long timescales. The upper mantle flows more easily than the lower mantle because of the increasing temperature and pressures as you descend into the Earth. The Earth’s tectonic plates float on top of the mantle. In some places, the plates are sliding under one another, returning rock back to the interior of the Earth. In other places, the plates are spreading apart, and fresh volcanic material is welling up to fill the cracks. Inside the mantle, convection is slowly taking place – like in a lava lamp. Hotter material, heated by the core of the Earth rise slowly to the surface of the mantle. Material cools near the crust and then sinks back down to the core, to repeat the process all over again. It’s believed that this convection helps drive the motions of Earth’s tectonic plates. We have written many articles about the Earth for Universe Today. Here’s an article that talks about how scientists might study the interior of the Earth using neutrinos, and here’s one about how rising temperatures could shut down plate tectonics.